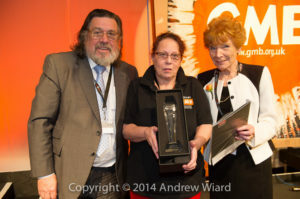 At congress in June 2014 shani hocking was awarded the Daniel Dennis award for health and safety which was presented at congress by the actor and trade union supporter Ricky Tomlinson and GMB national president Mary Turner. The branch congratulates Shani on this achievement and also winning the TUC award which was presented at the TUC congress in Sept 2014. This highlights how successful the branch is becoming which can not be achieved without the support of our members and reps. Have you done anything to shout about or has your workplace rep earned the praise of his colleages and deserves a recommendation in some form please let me know.